What about that awful woman on Fox News, Laura Ingraham? Even if I usually disagreed with her, there was a time when I respected her as a legitimate conservative voice. But is there any doubt she has long-since deteriorated into nothing but another of the many awful women on Fox News? I still give her credit for not trading on her legs, as do most of the women on the network, but otherwise she’s no longer anything but another obnoxious mouthpiece for President Trump. First she said that America is no longer recognizable based on “demographic changes,” an obvious reference to immigration and the ever-increasing “other” in a once predominantly white nation. When she was criticized for her obvious racism, she vehemently denied it. What “demographic changes” was she talking about? And what a romanticized version of a pure, lily-white nation that never was. Who does she think she’s fooling? As one commentator aptly pointed out, this kind of talk can no longer be described as a “dog whistle” or a “wink,” but is better described as a bullhorn. And once the bullhorn goes off, denying its intent is nothing but an insult to our intelligence. It’s as if Fox news and the rest of Trump’s allies keep testing the waters to see what they can get away with, and so far they’ve encountered few barriers. 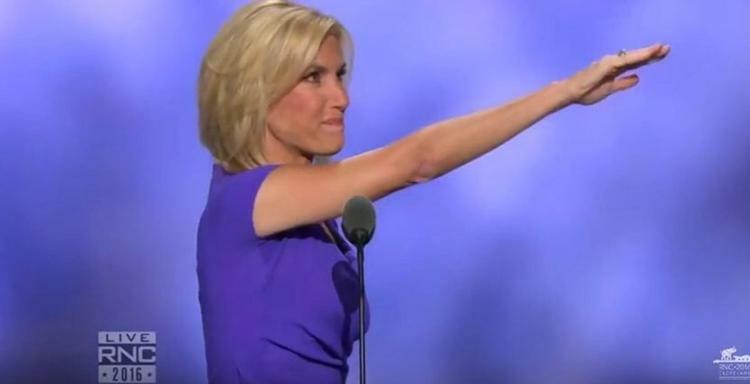 Neither Ingraham nor the rest of them at Fox News have any shame; they look smugly out at the camera as if daring the rest of us to betray the First Amendment and demand they be silenced. What is there endgame? Do they think they’ll succeed in increasing the size of Trump’s base? No matter what Trump does (perhaps including shooting someone in the middle of 5 th Avenue, as the President declared during the campaign), the base doesn’t seem to grow or shrink by much. But bullhorns, and the inevitable publicity they generate, do serve to nurture the base’s loyalty, and its loyalty to Fox News.